To understand why you don’t have to be rich or famous to be a victim of hidden surveillance devices, you first need to understand why someone might want to listen in on your conversations or watch your actions. Read on to find out why you might need your home sweeping for bugs. If your home is under surveillance, it generally means that you have something that someone else wants. The information could simply be your daily routine; this knowledge allows someone to break-in without the risk of finding you or anyone else at home. Most people associate this with large fortunes or access to secret information, but it doesn’t have to be. Smaller amounts of money, antique collections, or even just your electrical goods could be enough for someone to take these steps. For other perpetrators, the information is simply your actions, either for their own enjoyment, to satisfy unhealthy levels of jealous curiosity, or even to make money in the form of bribery. Other reasons could involve your connection to someone else, such as the people you work for or with. You could have access to information on your computer that they want to uncover, or keys, passwords, or security codes that they need. Most individuals are unaware of why they have been placed under surveillance until after counter surveillance measures have been taken. Once bug sweeping takes place, and the source of the devices is found, you could find yourself very surprised by the end result. If you have concerns that you may be the victim of electronic surveillance, then get in contact with Advanced Sweeping today. Use a secure phone away from your home to call the team on 0845 512 1552 and we will discuss your threat level and the best way forward for you. 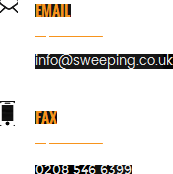 If you want to see exactly how we can help with sweeping for bugs, then visit http://sweeping.co.uk/.